Baked ziti with meat is a family favorite around here! It’s loaded with pasta, meat sauce, and creamy cheese. The bechamel sauce is simple to make and really takes this whole dish over the top! I have just about burnt my family out on pasta over the last couple of weeks. I’m not normally a huge pasta person (let’s be real, I’m usually a taco girl) but lately it’s just been all I’m craving! Pasta, cheese, meat sauce. You can’t go wrong. This baked ziti with meat sauce is quite possibly my new favorite pasta dish. It’s even better than lasagna, and that’s saying a lot! The trick to making this the BEST baked ziti recipe is the bechamel sauce. It sounds fancy and a little scary, but I promise it’s super easy to whip up. We’re going to start by cooking up some ziti. While that is boiling, start your meat sauce. This is just ground beef and a jar of marinara. I know that sounds too simple – how is this going to the best baked ziti if I’m not even making the sauce from scratch? Trust me, friends. You’ll want to use your favorite brand of marinara here – I’m using Rao’s because I think it’s the all time best. I love it, though it can be a bit pricier than other sauces. 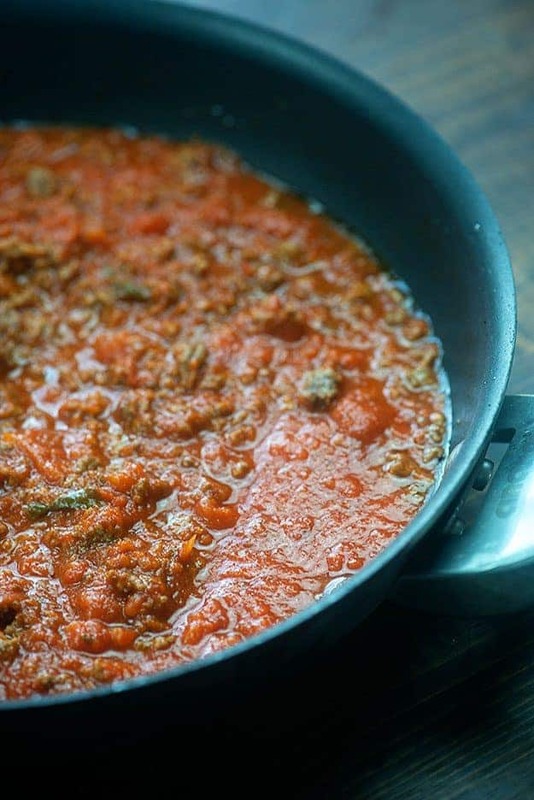 While your meat sauce is simmering, go ahead and whip up the cheesy goodness. You’ll need ricotta, Parmesan, egg, and Italian seasoning. This mixture is basically what you’d use in a lasagna, so you know it’s good stuff. Once that is combined, you’ll make the bechamel. Melt some butter in a sauce pan and then whisk in some flour. Let the flour cook for a minute and then pour in some milk and cream. Whisk well until the mixture thickens and then season with pepper and nutmeg. 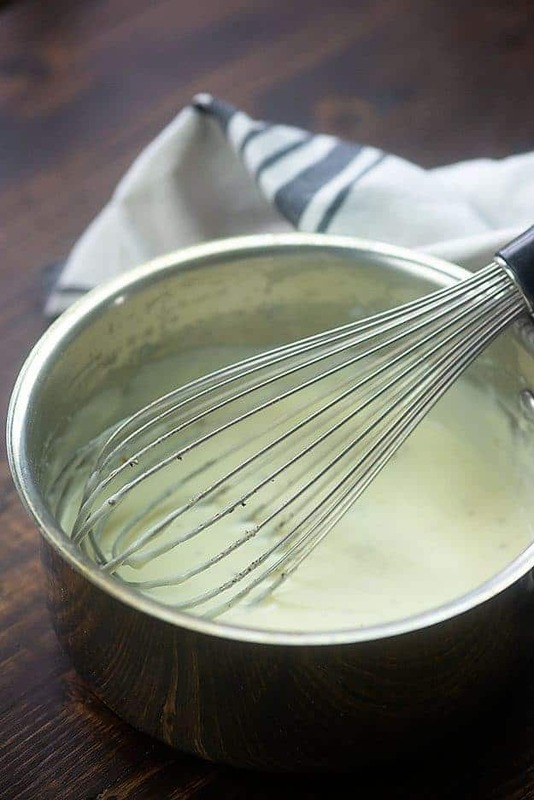 Congratulations – you just made bechamel! So easy and it’s basically the best part of this dish. Just wait til you get a creamy bite of this one. It’s time to start mixing this all up. You’ll add a bit of meat sauce to the bottom of your baking dish and top it off with ziti. Add some meat sauce, bechamel, ricotta, and mozzarella. Repeat the layers. Boom. You’re ready to bake. This is seriously the most perfect comfort food! 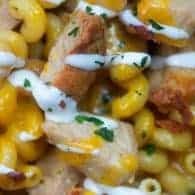 Alfredo Sauce: It doesn’t get much more decadent than my homemade Alfredo! 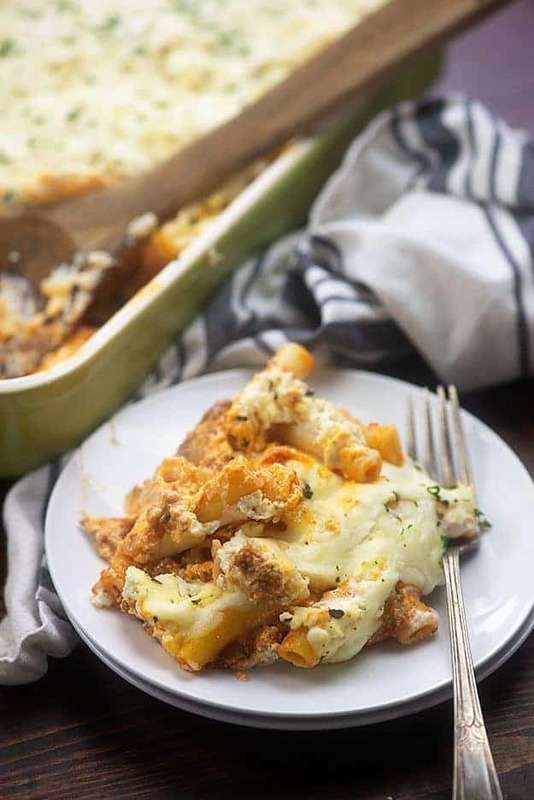 Lasagna Recipe: There are no noodles in this low carb skillet lasagna! Italian Pasta Salad : A must make every summer! Turkey Meatballs: Just as tasty as beef meatballs, but a little lighter. Shrimp Alfredo: Always a hit! Million Dollar Spaghetti: Probably not authentic Italian, but man it’s good! 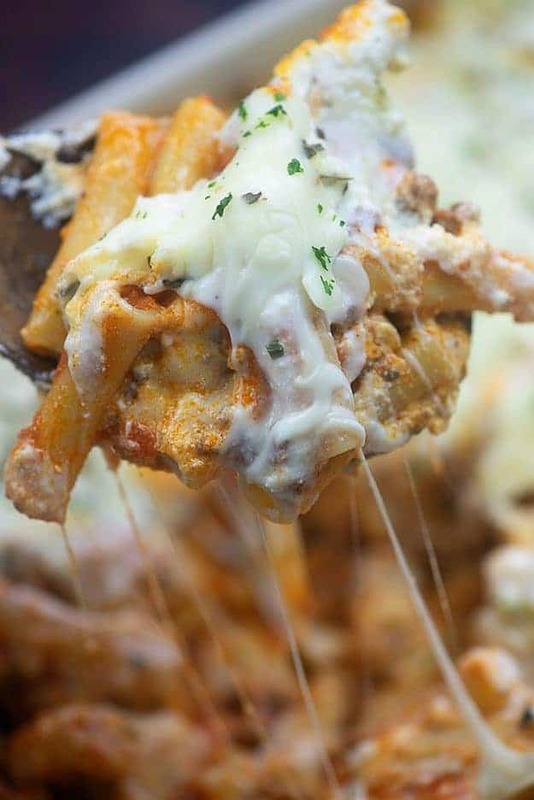 This is my all time favorite baked ziti recipe. That bechamel sauce really makes it special. Bring a large pot of water to a boil and add plenty of salt. Boil the pasta for 3 minutes less than the package directs. In a large sauce pan brown the ground beef. Drain the fat. Stir in the spaghetti sauce. In a small pot melt the butter and whisk in the flour. Cook until hot and bubbly. Whisk in the milk and cream and cook 5 minutes or until the sauce has thickened to a gravy consistency. Stir in the pepper and nutmeg. 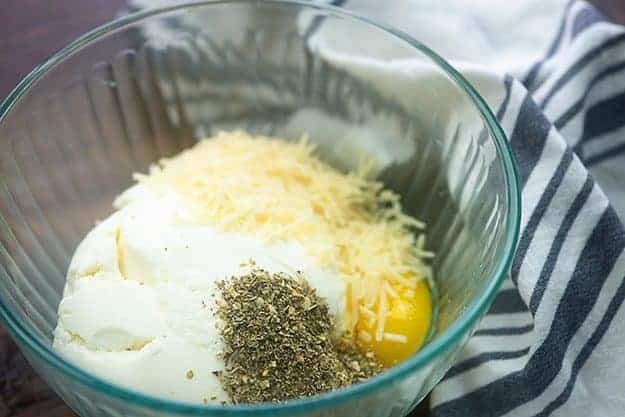 In a medium bowl mix together the ricotta, egg, 1 teaspoon of Italian seasoning, and the Parmesan cheese. Spread 1/4 cup of the meat sauce in the bottom of a 9x13 baking dish. Pour in half of the ziti and spread it out. Pour on half of the meat sauce and spread it over the ziti. Pour on half of the bechamel sauce. Drop dollops of the ricotta mixture over the meat sauce and then sprinkle with half of the mozzarella. 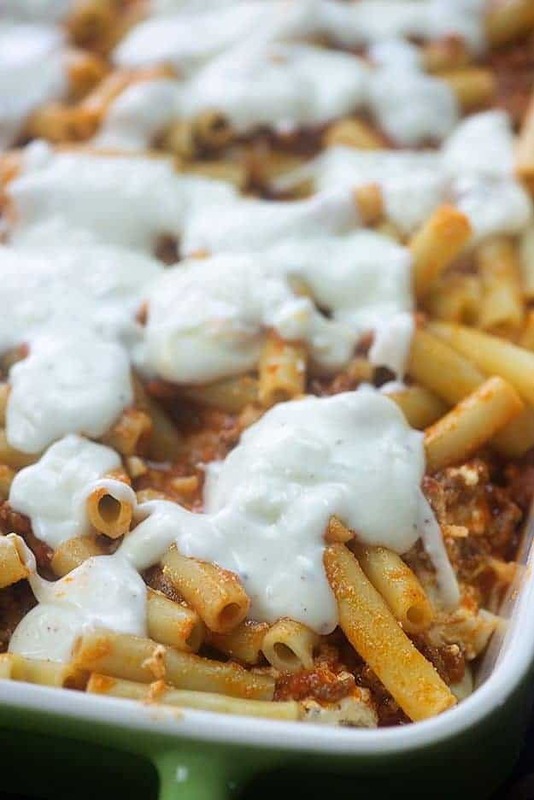 Repeat the layers of ziti and meat sauce. Pour the remaining bechamel evenly over the top. 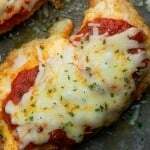 Place the remaining cheese on top and sprinkle with the 1/2 teaspoon of Italian seasoning. Bake covered for 30 minutes in a preheated 350 degree oven. 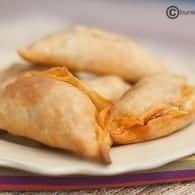 Remove the cover and bake for another 10-15 minutes or until the cheese is melted and bubbly. This post was originally published in 2011. Updated with new photos 2019. Oo I’ve never had bechamel with a baked ziti. I want! “For the love of Bieber” heh heh so good. I’m with Erin – I don’t think I’ve had bechamel with a baked ziti before. Must try soon!! 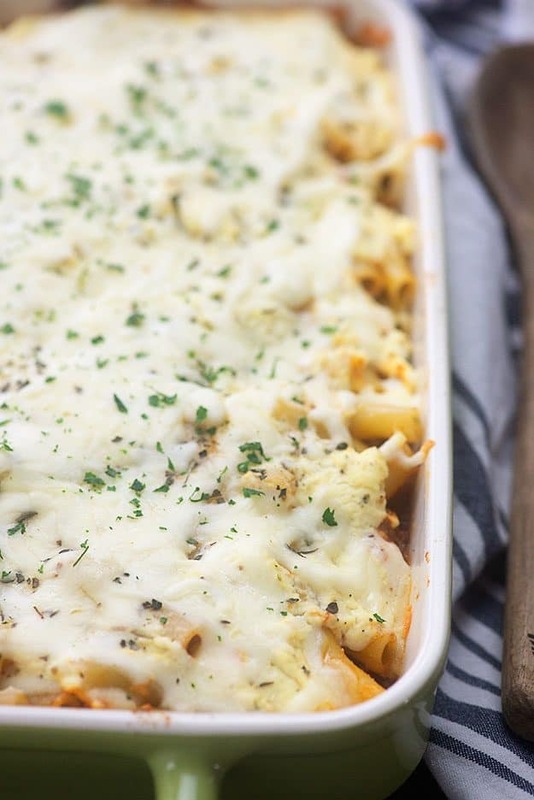 Look at you and me with our baked pasta recipes today! We are like twins! And as an 100% Italian, all I have to say is this looks damn good. I confess what your posting has done is to make me crave lasagna. That is meant as a compliment. And don’t worry about the not being really Italian…I’m predominatly Swiss, Norwegian and Irish and have taught classes on Italian cooking. Would this be good with a touch of white truffle oil? And at what point would you recommend adding it, if yes? Having grown up in Boston where there is a huge Italian-American population I have to say we never added a bechamel sauce to any baked pasta that had a tomato product. Well, I tried it a few years ago and WOW it really enhances the casserole. If you haven’t tried it, you should. Can hardly stop to talk, I’m on my way to the grocery then back home to throw this baked ziti in the oven! Hope you love it as much as we do!! What kind of cream? Heavy whipping cream? Half and half? 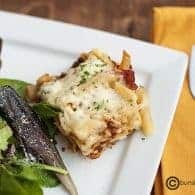 Baked Ziti is one of my favorite Italian dishes! This one’s making my mouth water!! Getting ready to make this for 20 people! Can’t wait to try it. Sounds wonderful! Double batch coming up! 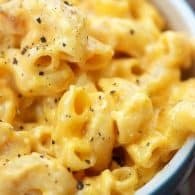 Can this be made the night before, kept in the fridge, and go in the oven the following day? Thank you!